Spotify has named “We Are Hunted” as their newest featured app and for good reason, the new third-party application for the music service allows users to quickly and easily discover new music that matches their interests. As a worldwide leader in music discovery We Are Hunted acts as an online music chart that changes based on what people are saying online about their favorite artists and music. The system works by scouting blogs, message boards and social media mentions to chart the current top 99 songs online in real-time. If you’re looking for emerging music and songs from mainstream artists this is a great app to try withing your Spotify console. 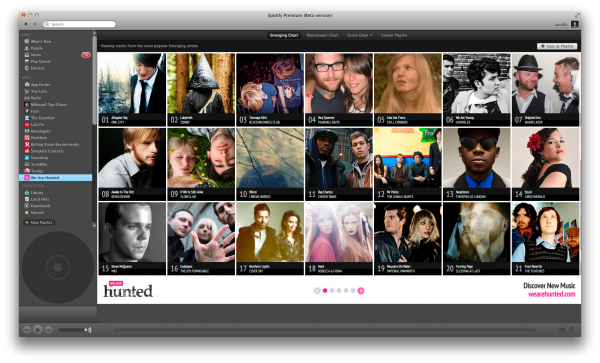 The We Are Hunted also provides genre charts which can more aptly display top and emerging music for each users musical whim. You can try the program right here!